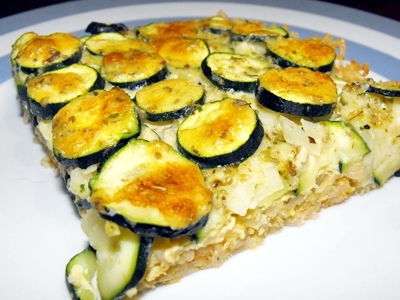 This zucchini quiche recipe offers a nice twist with its rice base, which makes it unique compared to other quiche recipes. Making a quiche is just one of the many savoury dishes than can be prepared using zucchini. Zucchini muffins are another favourite of mine. Another name for the zucchini is the courgette both are commonly used in different areas all around the globe. With the zucchinis many names I often used to confuse the zucchini with cucumber as they are both green look similar on the inside and can have the same shape. However cucumbers are often eaten raw while zucchini is mostly served cooked. Check two cups of rice for stones and rinse it. Then put the rice into 3 and 3/4 cups of boiling water. Reduce to the lowest heat and let the rice simmer for about 20-25 minutes. Let the rice cool down for half an hour or longer. Preheat the oven to 180 C°. Convert! Stir 3 tablespoons of corn flour, the 1/2 cup of grated cheese and the egg under the rice. Season with salt, pepper and some vegetable stock powder. Grease a 29 /21 cm baking tray (or line with baking paper) and spread the rice base evenly over the base of the tray forming a rim around the edges. Wash and cut the zucchinis into 5 mm thick slices. Cover the base with half of the sliced zucchinis. Peel and dice the onion and the garlic cloves. Spread them over the zucchini as a second layer. Season with basil, salt and pepper. Top the onion layer with the second half of the sliced zucchini. In a bowl whisk 1 cup of cream, 1 cup of milk and the three eggs together. Stir half cup of grated cheese under. Season with basil, pepper, salt, vegetable stock powder and paprika. Mix well, then pour it evenly over the top of the quiche. This quiche is best served warm with an easy salad recipe. We thrive on feedback and are looking forward to yours use the contact form or just post a comment on the Facebook plug-in at the bottom of the page. Here is the place to share any creative zucchini quiche ideas.